An insider's guide to Hydra, featuring the island's best hotels, restaurants, bars, things to do, attractions, and how to travel there and around. By Marc Dubin, Telegraph Travel's Hydra expert. A whaleback ridge looming from the sea, Hydra shot to fame in 1956 as the location for A Girl in Black, directed by Michael Cacoyannis, with an extra filip in 1957 for hosting Boy on a Dolphin, starring Sophia Loren. The clip-clop of the beasts' hooves on marble pavement and their drovers' cries are very much part of the soundtrack here. Soon various foreign personalities (including Leonard Cohen) bought and restored property here, joining prominent Greeks who had long appreciated the island’s charms. Sumptuous mansions and humbler vernacular homes arrayed amphitheatrically around the marble-quayed harbour date from the 18th and 19th centuries, when Hydriot seafaring prowess brought great wealth. Despite its high-profile reputation, and the mid-day arrival of “One-Day Saronic Cruises”, the island remains endearingly time-warped: as a listed architectural reserve, all new construction is (theoretically) banned, and it’s blissfully free of motor vehicles except for a few miniature rubbish trucks – photogenic donkeys (or mules) do most haulage. The clip-clop of the beasts' hooves on marble pavement and their drovers' cries are very much part of the soundtrack here. Ferries: From Aktí Miaoúli quay in Piraeus, gate E8, hydrofoils or catamarans sail for Hydra (Ýdra in Greek) almost hourly in peak season, but typically just three times daily October-May. At present, only Hellenic Seaways (hellenicseaways.gr) provides service; online bookings are best, pick up tickets at its booth on Aktí Miaoúli. If – and only if – you're on a driving tour of the Peloponnese, there is a better alternative: Hydra Lines' small, very inexpensive boat Freedom III, which plies 7 times daily in season (6 on Sun) from Metóhi Thermisías, a tiny port (with no bus service) immediately opposite Hydra on the Peloponnese, 25km east of Kranídi or 25km west of Galatás. Leave your car in the parking lot with the Hydriots' vehicles; see current schedules at hydralines.gr. 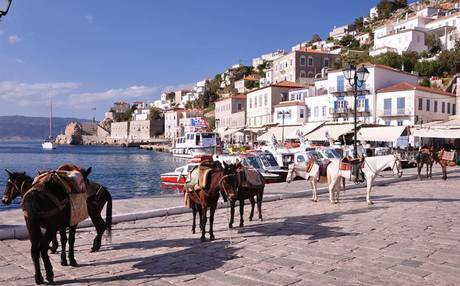 Once on Hydra, it’s shanks pony or taxi-boats – no buses, no scooters for hire. Baggage is transferred to the better hotels by hand-cart, while taxi-boats (€3 one way) ply as far as Plákes Vlyhoú with its hotel from early in the season. Only later in the summer are little boats to Bísti beach (€10 one way) at all reliable, leaving around noon and returning early evening.